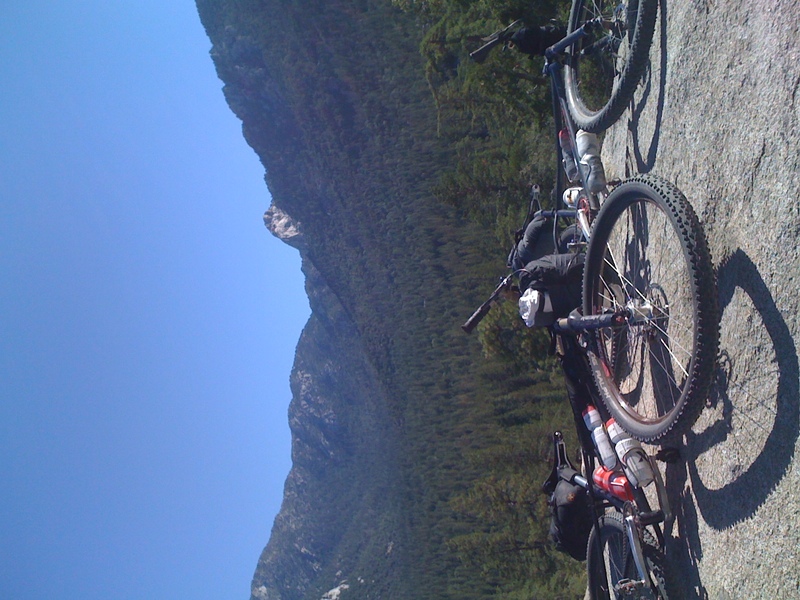 Two days, one night… Idyllwild to Solana Beach. Family pickup at the end. About 160 miles or so. 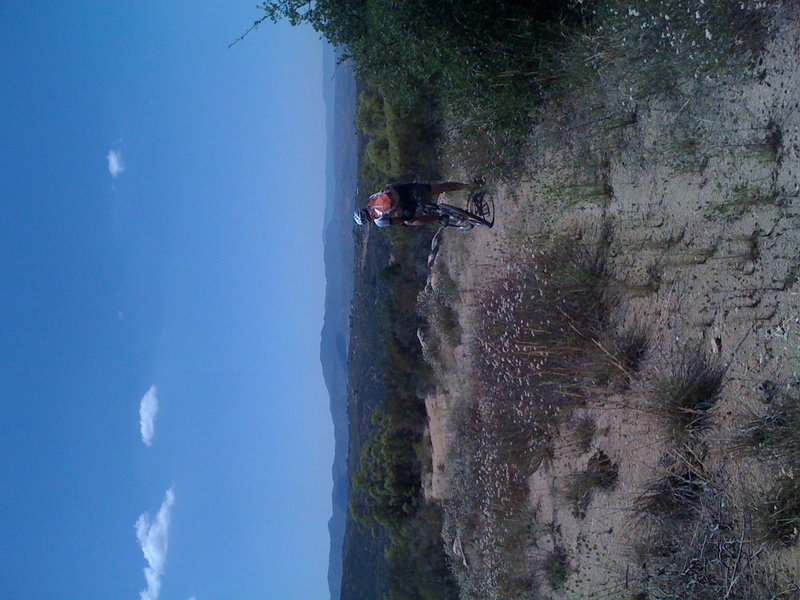 Our chosen route to the beach incorporated a lot of dirt road, some asphalt, and very little singletrack. I was striving to load my bike in such a way as the keep the center of gravity low, so I left the backpack at home and carried everything on the bike. It meant I couldn’t feasibly carry a water bladder, so hydration would be tricky but I figured it could be a worthy tradeoff for better handling on dirt roads. Climbing out of Idyllwild on Tahquitz View road. The last view of Strawberry Valley for the trip. We descended some of our familiar trails out of May Valley before making a bee line for Paradise Corners, at the end of Garner Valley. Along the way we ran into Geno… a local with the sort of warm demeanor that’s welcome in any setting, even at a place called Cow Pie Springs. We topped off on a snack and some glasses of icewater at Paradise Cafe. The heat was turning up. 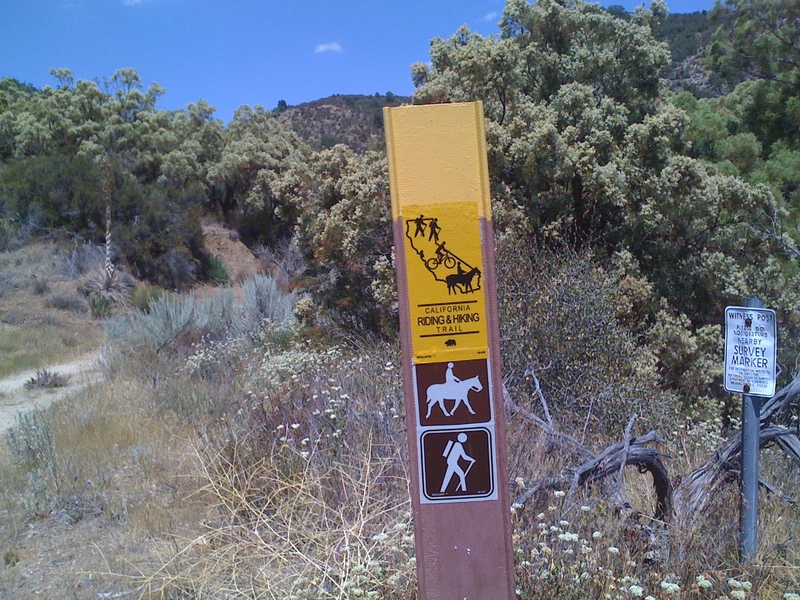 Starting the California Riding and Hiking Trail. 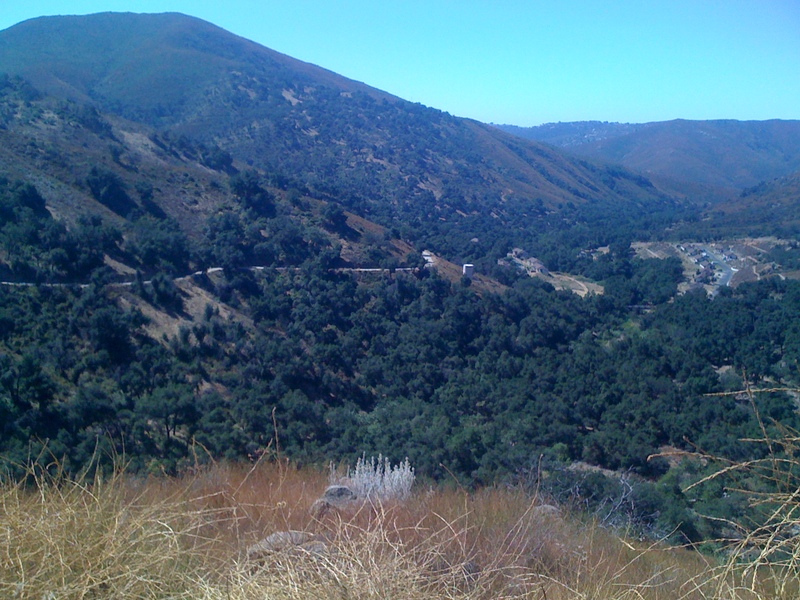 We joined the California Riding and Hiking Trail and pointed the bikes South. It got hot. And sandy. We took a break at a small pond, which provided some jungly shade and cooler temps. 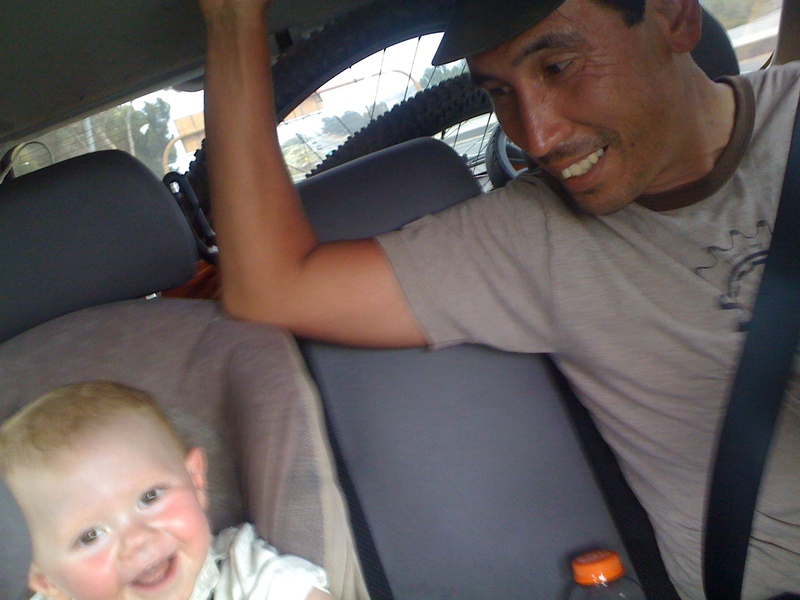 An old apple orchard gave us a sweet boost on the next climb out to Chihuahua Valley. 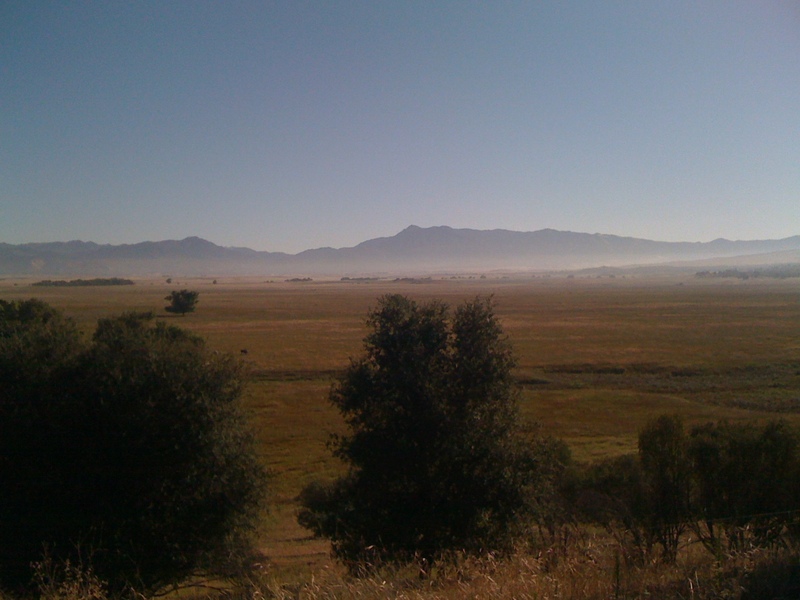 We enjoyed the riding, tried not to focus to heavily on the Warner Springs destination. We’d get there when we’d get there, I figured. CRHT is marked sporadically by yellow topped posts. The first significant stretch of pavement, coming in to Warner Springs. We ended up coming down a dirt track to Sunshine Summit rather than into Lost Valley / Warner Springs. Though it set us back about 9 miles (pavement, even) it was a blessing as we were able to stock up at the Sunshine Summit Market and the Mexican joint next door. The woman at the market remembered us from the last time we’d bikepacked down her way, for Nick’s birthday. We loaded up burritos, split a sixer (cans for easy carry out) and headed out to find camp. 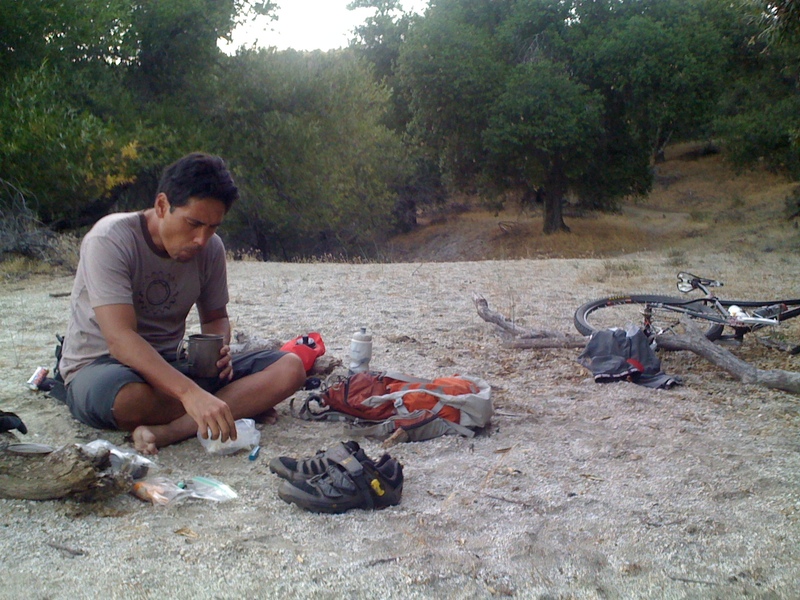 We found camp beside a draw in a comfy sandy area and celebrated with a feast. We bivvied under a nearly-full moon, sleep was sublime. Might’ve been for the best that we rode through on off hours? … and UP a very steep grade. We had some misadventures in navigation up top, and eventually found our way to Black Canyon road. A long, pleasin’ dirt descent. Black Canyon road. High speed dirt bliss. We descended Black Canyon road to the town of Ramona. I don’t recall the length of this road, but it was long enough to keep going… and going. Long enough to require a break. The road was fast, offered improving views and kept things lively. I was very pleased with the way I’d loaded gear on my bike, the Twinzer handled all the high speed curves with aplomb. We arrived in Ramona mid day. Hot. Noon thirty or warmer. We hit some highway, I think Hwy 78… white knuckle fast, plenty of traffic and HOT. We likened the descent’s breeze to having a blow drier pointed in our faces. 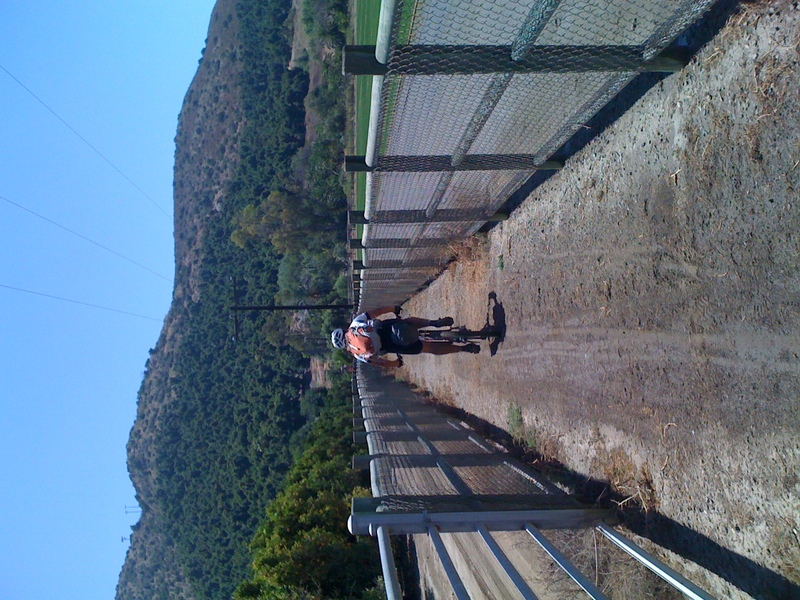 We pulled off the highway for what should have been our final major leg: a poriton of the San Dieguito River Trail. We estimated our arrival the beach to come in the next few hours, perhaps… just down the trail, under Interstate 15, into the Lake Hodges trail system, and through some hoity-toity residential area to the grand Pacific Ocean… we allowed ourselves some excitement. We took turns pulling the front, moving along at a good clip. I was taking a pull when I heard a familiar crunch-crunch-crunch sound from the tires, accompanied with a low hiss… in a flash, all four of our tires looked similar to chocolate-dipped ice cream bars, the kind you get rolled in peanuts. We were in a goathead minefield. 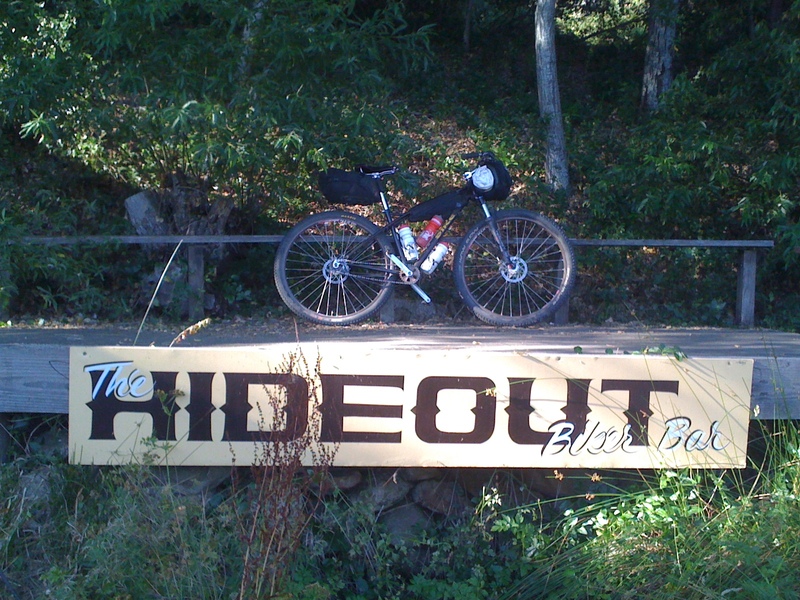 We rode up the road another quarter mile on softening tires to a trailhead kiosk and took measure. It wasn’t good. I discovered both my wheels’ sealant had dried, and we only one tube between the two of us left. The only patch kit (Dave’s) was missing its glue. I set to work on my Swiss cheesed tubes using every bit of ingenuity I could muster… an abrasive rock to scuff the tube (we were missing the sandpaper too) and a tube patch remedy a homeless man taught me many years ago, in Moab: pushing small pieces of plastic bag into the holes with a paper clip. The idea was to have the plastic bag “mushroom” inside the tube, filling the void. I’ve seen it performed, and work… but I didn’t have anything small enough, just a chopstick. Long story short, it didn’t work. After well over an hour of work we called Mary to pull the plug. Coincidentally, she was on I-15 just an exit away. She swooped in, cold beer in hand and saved the day… we looked awful. Are you wearing arm warmers, Dave? We quickly freshened up and jumped in the Rescue Subaru. Zander was stoked. We proceeded to the beach post-haste. In the end, the timing was right. We did the right thing, enjoyed every moment of the trip… especially the play time we shared at the ocean. It was Zander’s first time to the beach with full comprehension. It blew his mind and delighted him… We grubbed down with the delicious offerings at Pizza Port. Will I do it again? You bet. Maybe a different route next time, and maybe with some fresh sealant in the tires. 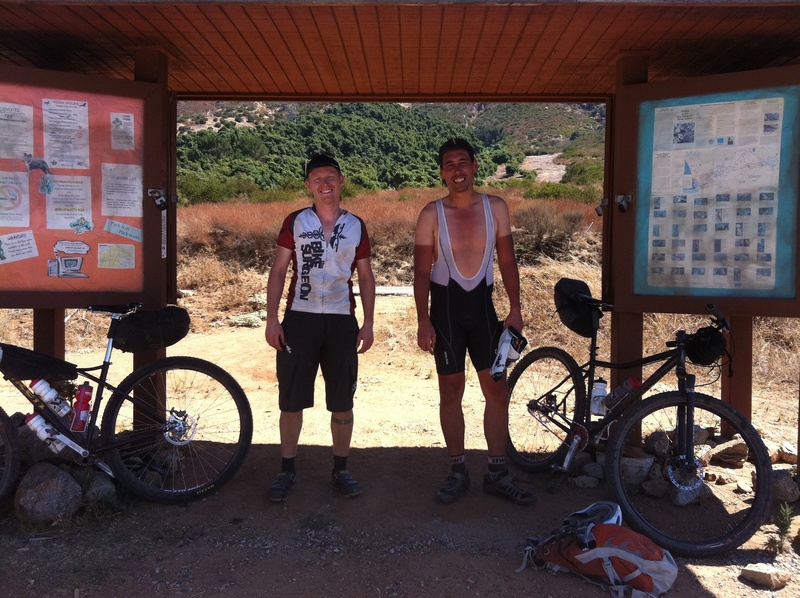 The trip has also got me thinking more and more about this style of bikepacking, a less technical mode of transport. This dirt/highway stuff really has some potential. 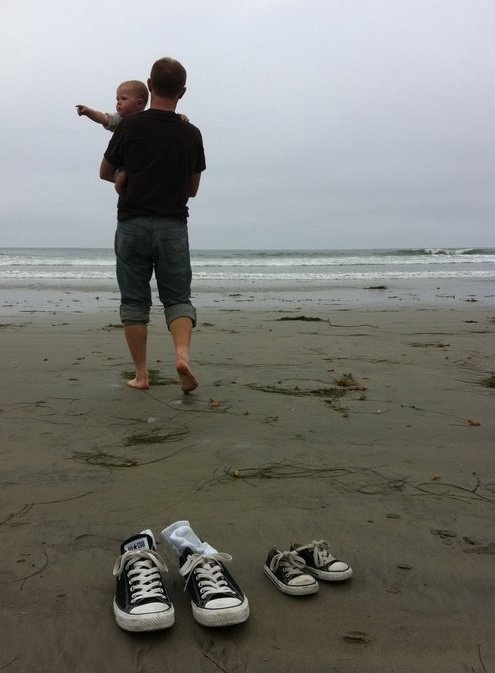 I love that last photo of you and Zander on the beach. Thanks Kelly. It’s possibly my favorite pic of me with the little guy all year. Nice image and have a great journey.